My RA marked lower is exactly like this one. Serial # is 227734. I'm building based off a vert take down lever lower with drilled out UM. What type of sling would something like this have had? Did this have a type 1.5 upper originally? A Type 1.5 receiver would be correct. If you're building it as a Republic of South Africa R1, the South African Defense Force issue sling would be the way to go. If you're making it a Rhodie (due to the drilled out M in U) you have more options. The RSA-made R1 sling looks like the one below. Note the end strap and buckle is 1.5" wide. They also modified these for the R4 by replacing it with a 1" end strap and buckle. Those are pretty easy to tell because the modification (where they replaced the end strap and resewed it) is pretty easy to see. They also made an R4 sling that looks like this but it's original and not modified. All three types are pretty hard to find, but especially the original 1.5" version. I only have a couple, and I've been chasing them for years. Nope, they're not for sale. Always have a go-to-hell plan. From pictures that I have seen it looks like most R1 rifles were issued with or used the SA Enfield type sling (PATTERN 61/64 RIFLE SLING. R-1, similar to British pattern 37 Lee-Enfield sling but 1.5" wide green web w/black hardware). I have also seen the above pictured Pattern 70 slings listed as slings used on the MAG 58, but there are pictures of R1 rifles with the Pattern 70 type slings (usually in the field). Does anyone know for sure if the Pattern 70 type sling was a regulation sling for the R1 and if so, when the change from the Enfield type sling took place? My Rhodie clone teaser pics. I just got a lower from Sarco with a lot of paint left Had to swap out the other. Tried getting pic of whole rifle but didn't come out very well. Now just need some paint to match and go on the upper, top cover, and barrel. That is what they sent you?! Did the Rhodie/SA FAL's with wood stocks use non-trapdoor stocks or both or? This R1 was converted by an SAS unit armourer to enable an operator who had lost his right lower arm to a mortar accident. Believed to be one of only two such mods done - the other by Cpl Bruce Wentzel (R.A.R.) for one of his black troops with a similar 'shortcoming'. We believe that this one got a mention in "Top Secret War" but can't find a copy at this time. Pardon the SA camo'd mag but couldn't find a Rhodie one at short notice. Last edited by Peter Wells; October 07, 2012 at 05:01. Reason: Forgotten how to post pics! Peter... That is an amazing picture with remarkable modification. Since you had to find a magazine to put into it for the photo, I assume this is part of your collection? From what I've seen in pics and surviving specimens, it looks like the wood stocks supplied by South Africa (either Belgian or SA made) were non-trapdoor. However, given Rhodesia's rather "unconventional" means of sourcing FN rifles and parts (read: anywhere they could find 'em), it's probably not impossible that some trapdoor stocks found their way into service. Remember the words of a fellow FALFiler, earlier in this thread, that a Rhodesian FAL can be just about any combination of parts that existed. Nothing shouts surpressor like a threaded muzzle. Flyer - The Enfield type, in both khaki (with bass hardware) and green (with blackened hardwae) were in use from incepton of the FAL (early sixties) till around 1978 when the R4 was being introduced. The wide sling was (as Hoot has said) made/modified into three configs - R1 with wide buckles and straps, R4 with narrow ditto and R4 converted R1 with wide buckles and narrow replacement straps). Un-modified R1 types are SCARCE! Thanks Peter. Was there an actual cutover date in 1978 or were the Enfield type slings still issued into the 1980s (until supplies ran out)? Also, was there a Pattern 70 sling for the MAG 58 or was one of the three types you mentioned just used with the MAG? Finally, do you know when they started to paint the R1s with the nutria brown paint? Thanks again for your replies. Hi Neil. Nope, it's at a local dealer, just came in from Zim and destined for a local collector who specialises in Rhodie stuff. Hi Flyer. After 1978ish no R1s were used operationally so the Enfield slings faded from the scene. We don't really have a formal "obscolesence" process so dates can rarely be firmly attached to things/events lke that. Last edited by Peter Wells; October 08, 2012 at 08:39. Reason: Can't spell! THANKS AGAIN AndyC.....lookie here what I got in earlier this week.....VERY NICE!! What was standard configuration of "ZA" marked FALs? What parts were painted brown? Type III? "R" marked selectors? Etc. Etc. There is no "standard" configuration for ZA marked FAL's. They were either leftover FAL's or L1A1's from Rhodesia (Zimbabwe), or from the UK (Zambia), or captured whatever from wherever. I've seen Type 1, 2, 3, and British L1A1 trigger housings marked ZA. What most people believe to be true of Rhodesia is not, but is true of Zimbabwe and Zambia. There were low standards, very little organization, and basically no adult leaders. The Soviet Union, China, and their surrogates, agitated the natives, and supplied troops and weapons, while "do-gooders" turned the world against apartheid, and once the civilized folks were driven out, the countries fell into chaos. Just got another Rhodie lower from Sarco. Is a type 1 with type C wood stock. Has 4 digit serial on the left bottom left and vertical take down. Guessing this a Belgian made? How rare are these? No UM marks or scrubs. No R marked selector. Pretty cool. Now have to decide to use this lower or the type 1.5. I had one of those myself and hootG has one still I believe. Does yours have an ingraved ZA# on the right side? Has RA #. No trapdoor on buttplate either. If you pull the rear sight off and look on the bottom of it, it probably has a date code and maybe other markings. Nothing said about the bolt, but three of four possible parts matching is still impressive! Sounds like a Belgian to me. What receiver were you planning to use this on? Is it possible Type III receiver FALs ever made it into Rhodesia prior to 1980? My Rhodie in its final stages. Need to patina the new paint with grime. Test fired and works great. Nice groupings but shooting low. Otherwise flawless. Had fun shooting it with Saigamantx yesterday and his Rhodie. Nice FN's guys. I have always loved FN's and have picked one of these up myself about 3 weeks ago. My FN is an original FN from Rhodesia, has the original receiver and all. The only thing it doesn't have is the original paint. The one I bought is refurbished with plastic furniture. Thank you for the wonderful site and keep it up. Please do share pictures with us. Yes please, we'd love to see your rifle! Any chance to see an all-original (paint or otherwise) Rhodie/R1 is welcome!! I cannot seem to upload a picture. Photobucket is blocked on our server at the moment too. PM me your email address and I will gladly send pictures to you. You are then more than welcome to post them on this thread for me if you like. Yer welcome! And welcome to the Files! Here are some links to photobucket. I am currently waiting for the license so I can go fetch her. There are some awesome rifles floating amongst you guys! 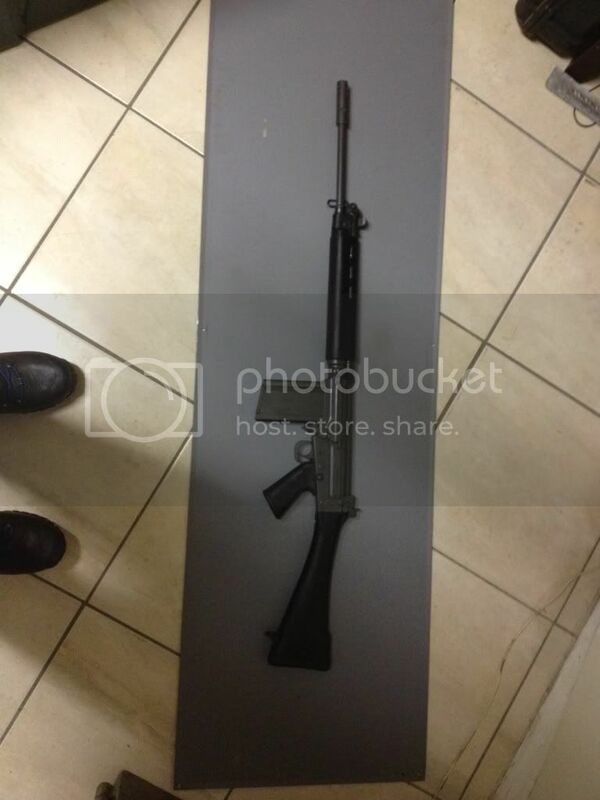 There are a few gunshops that sell ex rhodesian rifles (original) like the one that BlackgunCO posted earlier, for very good prices here so I doubt if this will be my last one. Some are in very bad shape and are screaming to be rebuilt!! Last edited by Dylanmurrish; November 02, 2012 at 05:13. Us SAfricans are on this forum too!! Great stuff. RSA, open a photobucket account quick... it is easy and for free. I would love to have a closer look at your firestick!! I can see it...looks like a civilian 50.00 FN to me. That said, I'm no expert. Does the lower receiver have an etched or electro-pencil marked number on the right side above the pistol grip, beginning with "RA" or "ZA"? "Does the lower receiver have an etched or electro-pencil marked number on the right side above the pistol grip, beginning with "RA" or "ZA"?" Have to agree. 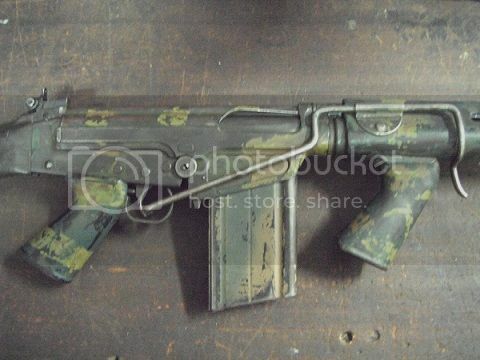 Not every FAL in Rhodesia was used by the Security Forces..It was possible to buy commercial civilian models, although this became increasingly more rare as the war progressed.There were a good many in the hands of farmers etc. Also many larger farms/ranches hired private security. I went on a bit of a road trip a while back and happened to stop over at a shop that had a bunch of these ex Rhodesian FN FAL's. I spoke to my Dad who was actually in Rhodesia during the war and inquired as to why most of the rifles I saw where missing the carry handle that I see on the rifles here. His answer was simple: "we removed them as they had little use to us and just got in the way. Some guys used to break them off too." The rifle I bought had its handle broken off near the gas tube. Pics? I bet you made Dad proud to bring one home. I have not brought her home yet as I am awaiting the licensing process . I have attached pictures above in links but I am not sure if they can be seen. Cannot wait to get her home and then feed her!! 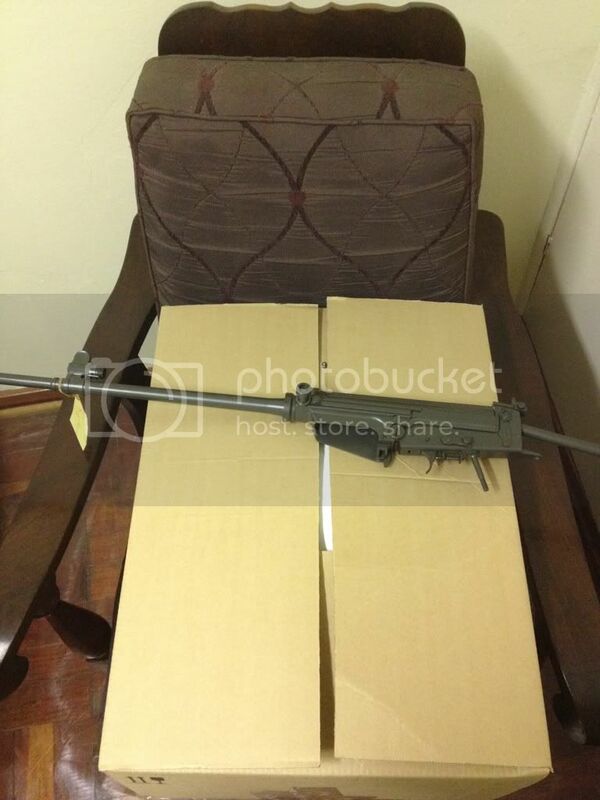 This may be of interest but was down in South Africa a few weeks back and a gun dealer friend took deliver of about 100 complete Rhodesian rifles that had been 'discovered' in the bush, as the story goes it was a weapons storage facility that was forgotten about and rumor has it there were about 2000 guns. I helped unload the rifles and most were well used but the bores were all decent, what was most interesting to me was a few l1a1 s as well as some Belgium guns but also a number of Imbel rifles, about 1 in 4. What does the R on the selector signify? There were two types the full and the semi, semi should have R on it. R1 shooter has it right. Unfortunately, most R selectors we see here in the US have been modified to eliminate the tip that stops the rotation to Auto. Here's a photo (not mine) that shows what they should look like.